In 2010 I visited North Sikkim for the first time, with my college friends. 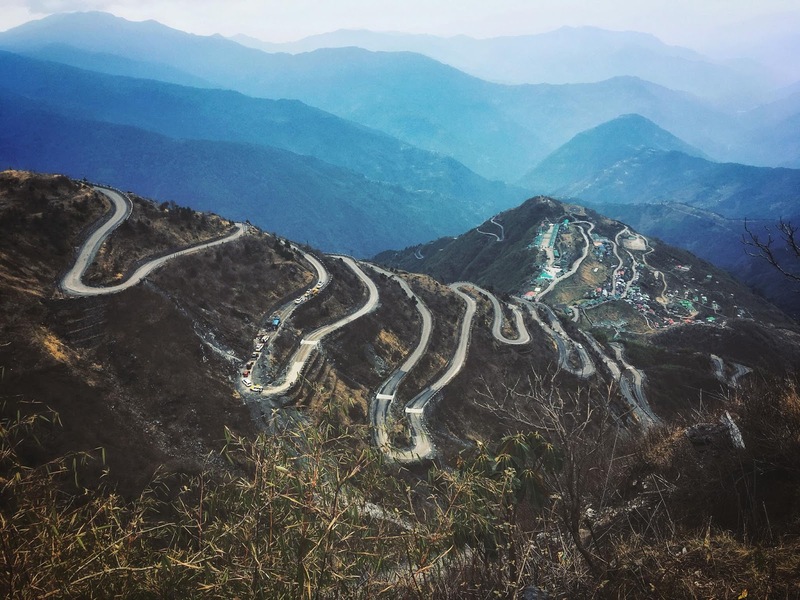 I used to ride a bike then and from that time I dreamt about riding to North Sikkim. Time has passed and I shifted from bikes to cars, but the dream was still there. 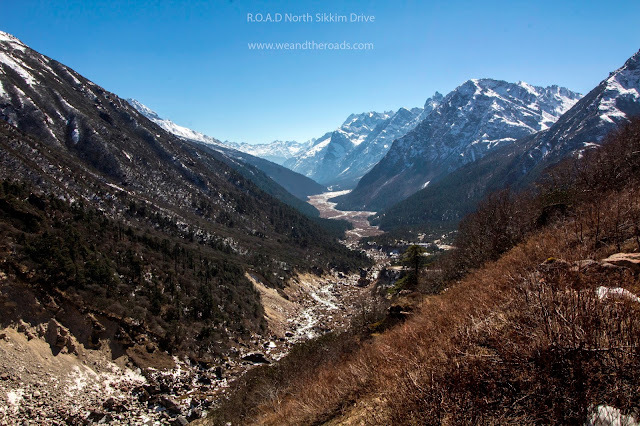 Many people have been to Leh and other places but very few could manage to North Sikkim. And to be honest I hardly know 2 or 3 people who has done the full circuit in their cars. 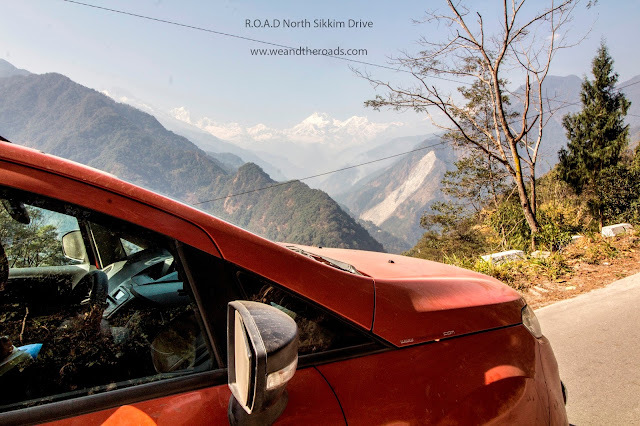 Not because its tough, because there are certain rule by Sikkimese Govt which doesnt allow private vehicles. But they do allows bikers. So cheer up if you want to ride !!! I am always attracted to Sikkim in an unknown way. 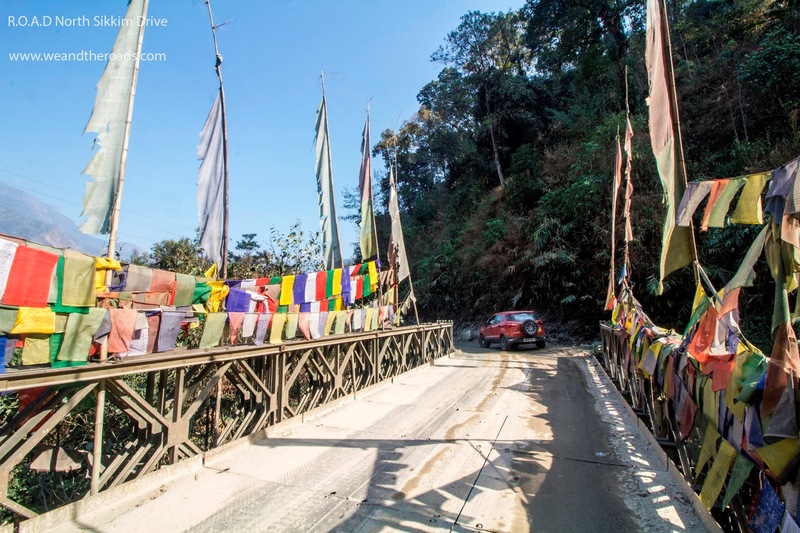 There are plenty to places you can visit in Sikkim, but the northern part has a different charm. And in January-February there are high chances you will get snow on the way. I almost lost hope few years back when I heard that no private cars are allowed. However this time we managed to get permits till Lachen and Lachung and with GOD's grace we couldnt manage till Zero Point and Gurudongmar. The plan for North Sikkim started when I was in Ipswich. Like all other plans many people showed interest initially. But as time went on only few people remained. Others had some other priorities and I am sure they missed this road trip very much. This time we used the holidays of 23rd and 26th. Our plan was of 5 days but you can extend it to 7 days if you want. 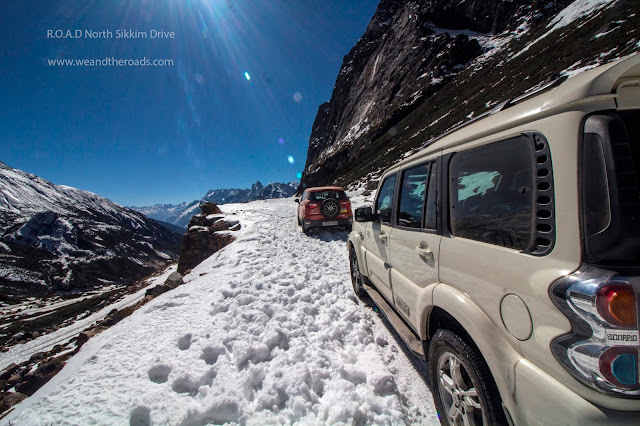 You wont get bored of Sikkim. Our group consisted of 9 people and 4 cars. Some of them were old friends. Kolkata - Mangan - Lachung - We started at 00:00 hours from Dankuni toll. Arony, Dip and Sinjini honored us by seeing us off at the toll plaza. Right now the Burdwan-Morgram route is the fastest and in good condition. We reached Siliguri by 9 in the morning and then headed towards Mangan. Our plan was to stay at Mangan that night and arrange for permits next day early morning. 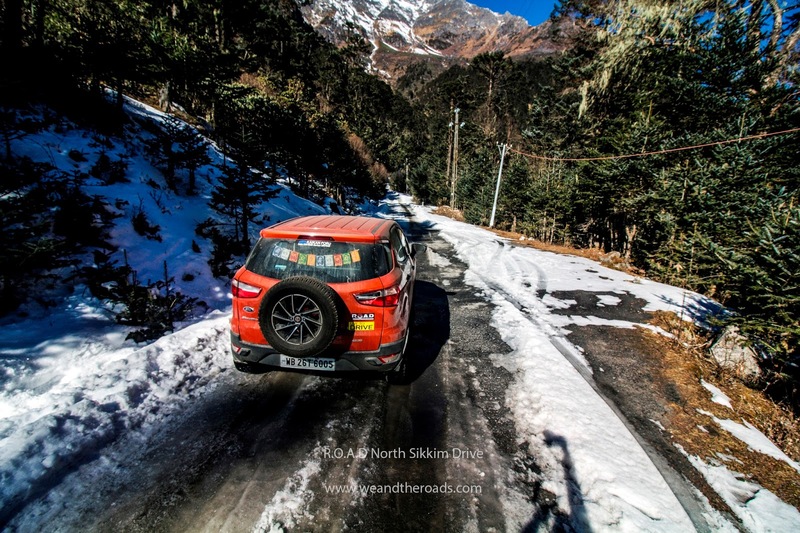 Permits for North Sikkim are given from Gangtok and Mangan. And after lot of research we found out that getting permit from Mangan is comparatively easier. Once you enter North Sikkim the road condition deteriorates rapidly. That day we stayed at Mangan. Next day (Tuesday) morning we went to Mangan District office and submitted all of our documents. Our permit was granted after few hiccups. As I said Sikkim Govt doesnt allow private vehicles towards North so getting permit is not an easy task. Luckily we got ours but our permit was till Lachen and Lachung only. On Tuesday noon after having lunch we headed towards Lachung. One can get a good view of Kanchendzonga from Mangan if the weather is clear. We were lucky enough to get that view. The picture doesn't do justice to what we saw. The first checkpost is after Mangan. At the check post we showed our permits and gave them a copy. Mangan to Lachung took us 5 hours including breaks. We stopped several times for tea, pee and sometime when the surrounding was scenic. The entire route is very much scenic. At Lachung we booked a homestay (Floret Hotels and Resort) which is on Lachung-Katao road. 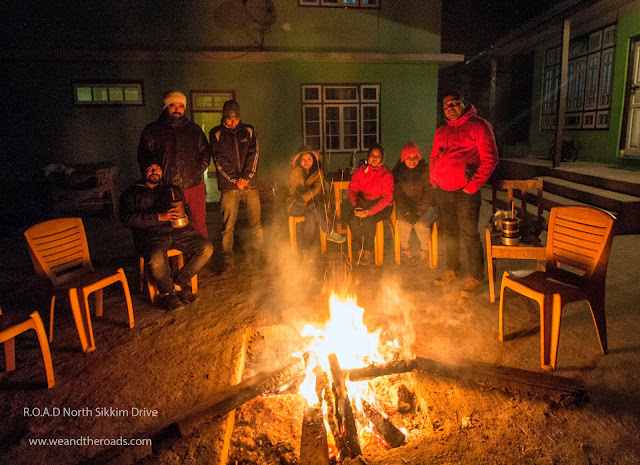 That night we were dead tired but Samaresh managed to get some bonfire after talking to the owner and it turned out to be a fun. Lachung - Yumthang - Zero Point- Lachung - Lachen- We were told we wont be able to go beyond Lachung, so we had to wake up early to go to the next check post and convince the army officers and take our chances. At the checkpost we didnt had to convince much. This is an off-season so there were less amount of tourists. That helped us to get past those check posts. But they warned us to drive carefully and not to push our cars too much as there could be snow on the way. 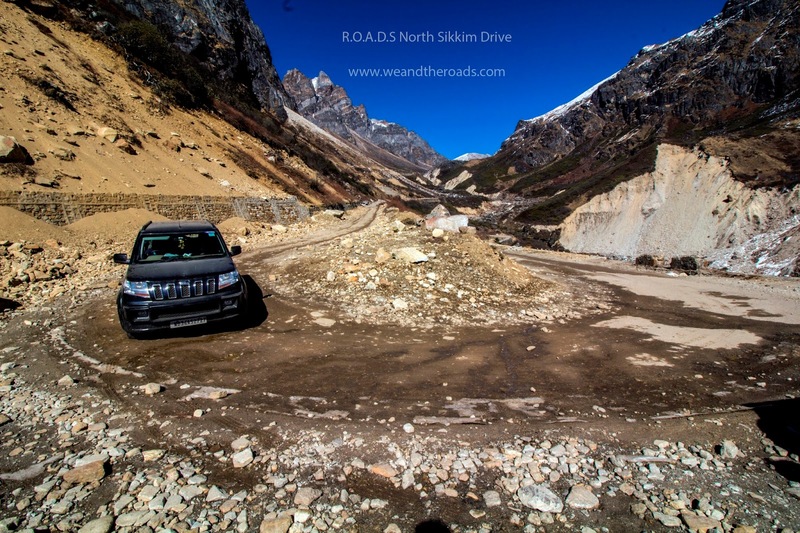 Finally we were on our way to Yumthang, one of the main places to visit in North Sikkim. For those who dont know what Yumthang is - It is a valley in North Sikkim and known as valley of flowers. It is at 11000 ft from sea level. If you visit Yumthang at the right time which is after April to Oct you will see the beautiful Rhododendrons. Otherwise in winter Yumthang is usually covered with snow. Just before Yumthang there are many shops. They sells jackets, caps, snow boots etc and food as well. We stopped at one of them to have our breakfast. And believe me maggie didnt taste better ever. 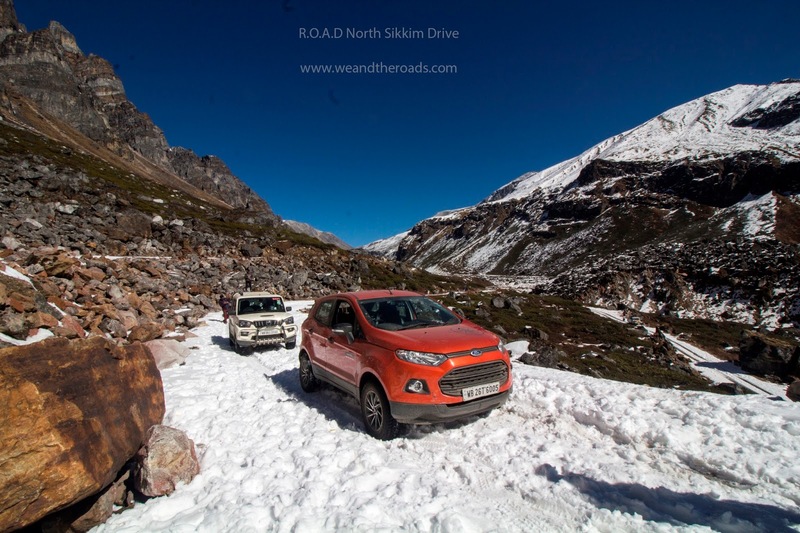 The owner also told us we wont be able to go till Zero Sikkim due to snow. Yumthang was covered with snow as expected. We went past Yumthang towards Zero Point. At one point we saw all the tourists vehicles were stopped and they didnt want to go further. When they saw our vehicles they said our cars wont go further. Even one of the drivers said "Baraf me rear wheel chalta hain, aapka nehi jayega". (Rear wheel drive goes better on snow, your car wont go further). This provoked us and we took our car another half kilometer until it was impossible for a two wheel drive to go. That place was 4-5 kms before Zero Point. We were both sad and happy at the same time because we couldnt make it to the top but we got a lot of snow. After spending some time and when our adrenaline got down we started coming down. We took our lunch at the same homestay in Lachung and headed towards Lachen. When we reached Lachen it was already dark. January being an off-season most of the hotels/homestays were .We didnt book before hand so we had to look around for a proper place to stay. Lachen is colder than Lachung and at that time the temperature was close to 4-5 degree. Finally around 7pm we got a good homestay with clean rooms and room heater. 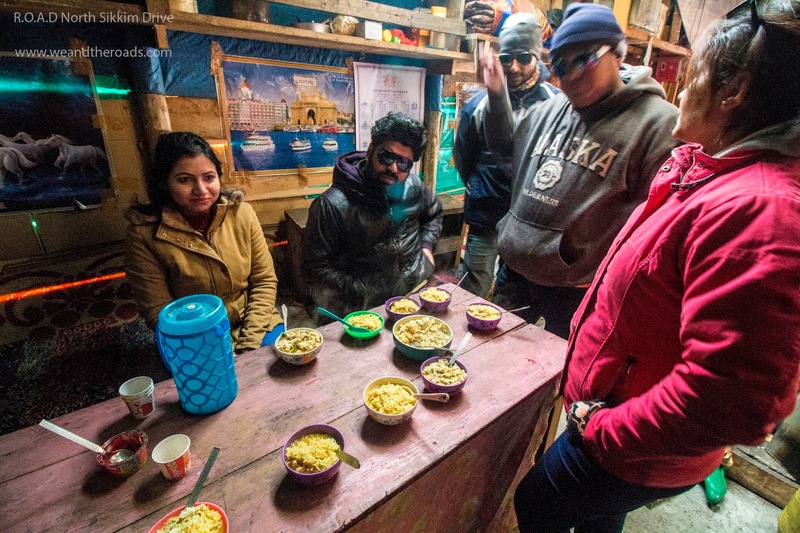 At night dinner was provided by the homestay and it was a usual Dal, Chawal, Sabzi meal. We did find chicken in Lachung but in Lachen it was close to impossible at this time of the year. The next day was the most challenging one so we went to sleep early. Lachen - Gurudongmar - Lachen- Siliguri- We started from Lachen at 4:30 am. We were strictly instructed by the homestay owner that if we dont go early we wont get past the checkpost. The army wont allow us. 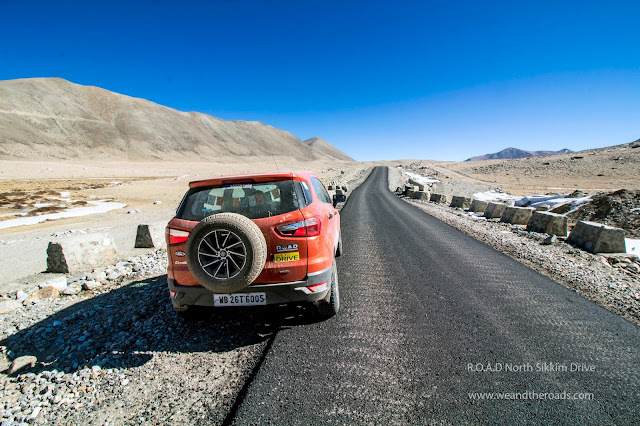 Lachen to Gurudongmar is 62 km which is suppose to take 3 and half hours. After Lachen the population decreased rapidly. As the height increased the trees grew taller. The bushes and small trees disappeared. The road condition is very bad with snow in places. We showed our permits at the first check post at Chungthang. I have been here before and knew there was a small shops which sells Maggie and tea here, but that was closed too in January. Around 7:30 we came to a place where a tourist vehicle was standing and there was a large area full of snow in front. We got down from our car and spoke to the driver. He said that there was some large potholes beneath the ice and he wont go forward. He said his car couldnt get stuck and as there were no other vehicles it was a risk. The tourists were very unhappy about not being able to go to Gurudongmar after coming this far. The lake was only 20-22 kms far from that point. We started inspecting the place together and on the left I found some hard ice. So I thought I could manage to cross from that side. Unfortunately Elessar got stuck after going few meters. The front wheels were not getting any grip. This incident left us devastated. After waiting sometime we saw a commercial bolero coming from the opposite side. The bolero crossed the section like a frog, jumping around. That gave us confident. We asked the bolero driver to pull our car and he happily did that. 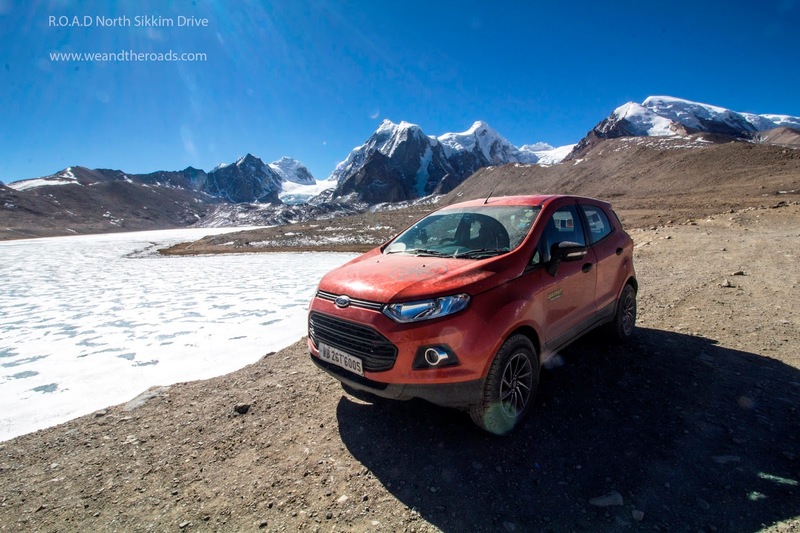 The driver boasted of being the only person that day to cross all icy obstacles and reach Gurudongmar. As time passed few more commercial cars came from Lachen and at one point all of them decided to cross the section. And if the car got stuck there are plenty of people to help. With the help of their direction we did manage to cross that section finally. The second and last check post is 16 kms before the lake. This area is a border to China and is very sensitive area. There are places where the army wants us not to take any photographs. The last 16 kms is butter smooth single lane road. This was newly constructed because last time I was here there wasnt any road. We reached the Lake around 10:30 am. Army do not let anyone pass that area after 12. They say the wind is terrible after 12. At 10:30 the wind was more than what we expected. Coupled with less oxygen the place tough to roam around. 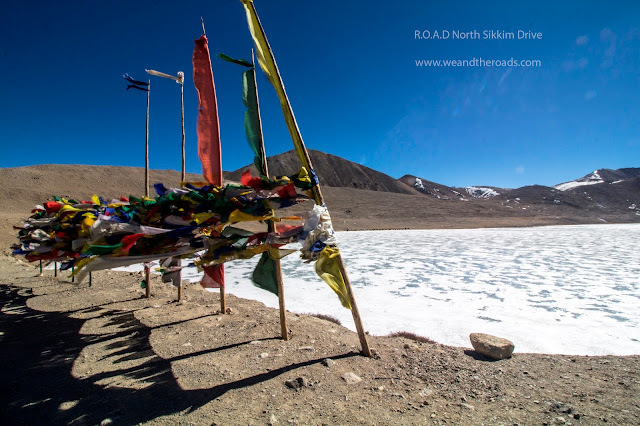 It is one of the highest lake in the world at 17800 ft above sea level. 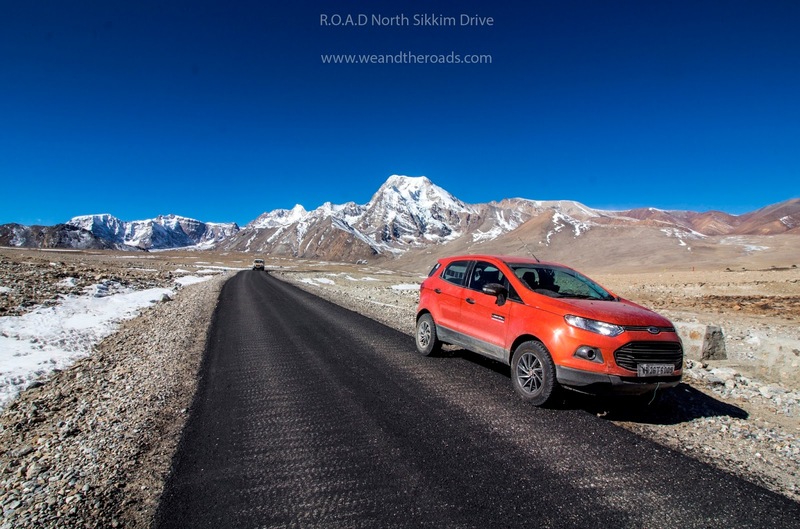 The beauty of Gurudongmar made the difficult drive worthy. This was the second time I was seeing the majestic Lake but I was equally excited like others who were there for the first time. We came back to Lachen at 4pm. We were suppose to go to Upper Dzongu that day but due to time constraints we decided to drive further down, to Siliguri that night. 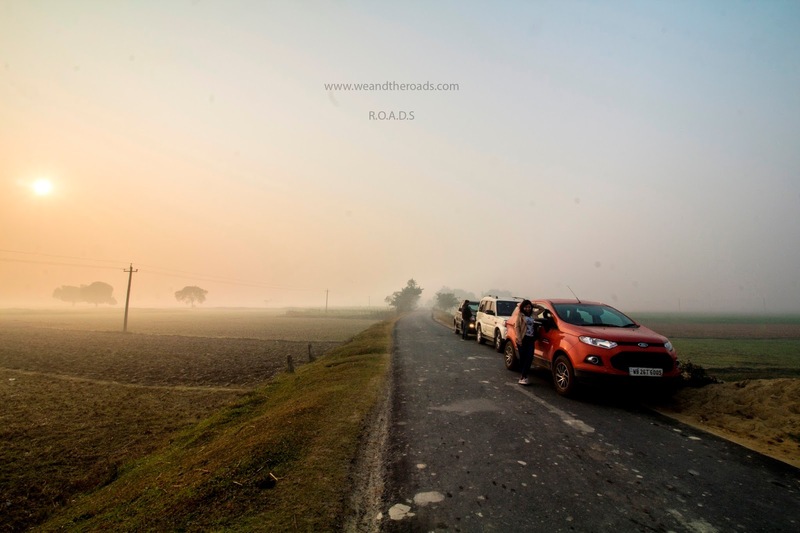 Siliguri - Kolkata - We drove the entire friday back to Kolkata on the same route. Theres nothing much to write about it. The botolbari route is really helpful during daytime. But I would not advise to cross that section during night. 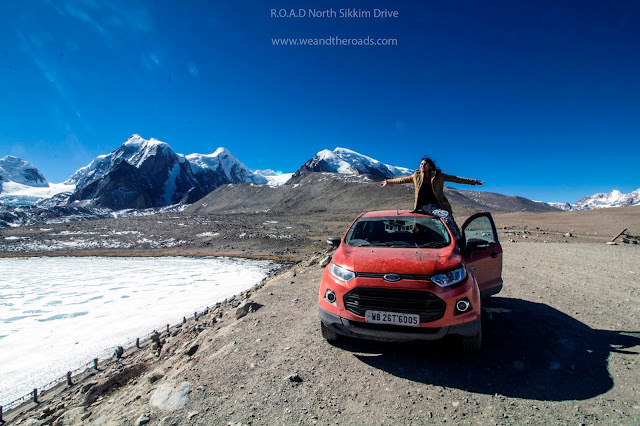 When we started planning for North Sikkim we didnt know if that was possbile at all, and when we came back from there it is like a dream come true. The feelings is inexpressible. 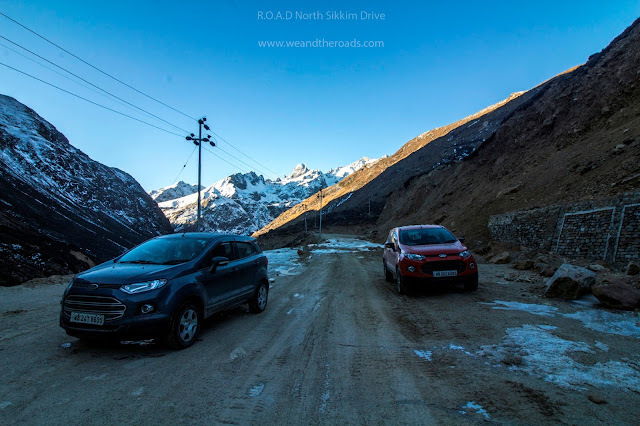 Still I would not advise to take any small car to North Sikkim. Its not that the car wont go, but for a hatchback the road is too much. The suspension might take a toll. In fact I broke a part of my front bumper and one of the front mud guards while crossing some bad patches. One of my tires was punctured and changing tires at high altitude is a tiresome work. However the beauty of North Sikkim is unparalleled. 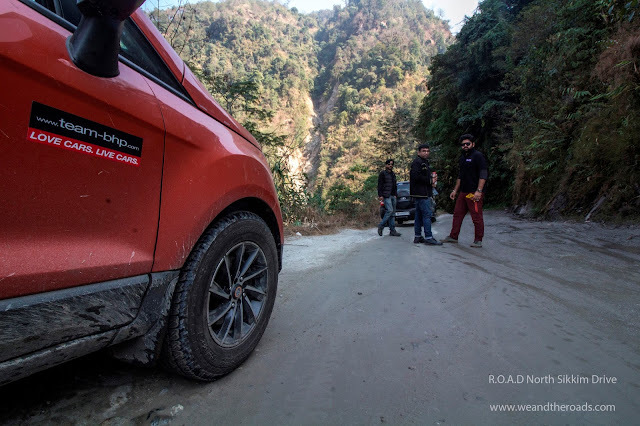 The entire road trip became more fun because of the group too. Traveling in a group is always fun and a road trip is the best way to get along. The new friends became close and the old ones remained forever. Awesome blog....!!! The pics are great...!!! Missed the trip 😞...!! Thank you. You Thar is be the perfect vehicle for this terrain.